We will be closed 7/18-7/22/17. We are headed to Vegas for the AWFS (Association of Woodworking & Furnishing Suppliers) Fair. If you're headed to AWFS, stop by the ARBORTECH Booth and say hello to Treg Sherman. For all inventory and custom project questions, please send all inquiries to info@urbntimber.com and we will get back to you as soon as we can. Join us for our end of the Summer open house at the Urbn Timber Shop. Our kiln will be recently unloaded with new inventory and the walls lined with live edge Walnut, Ash, Red Oak, Maple, Sycamore, Elm. Tysi will be crafting up small bites and drinks will be provided. Not to skip over Fall (because it's our favorite time to mill), but this open house is a perfect time to start thinking about Christmas gifts. Come on out to pick our brains about your next project, check out a demo or two and grab a bite to eat. We hope to you see you and your friends at the shop! This 38" wide x 51" long maple top is being installed tomorrow as a Center Kitchen Island Top. The cutout is for a stove top. We love the detailed spalting in wood grain. Check out our Facebook and Instagram tomorrow afternoon for a picture of the installed piece! We just wrapped up this Book matched Black Walnut Kitchen Table for Kyle Bullock. The dimensions are 3ft wide x 5ft long and can seat 4-6 people. 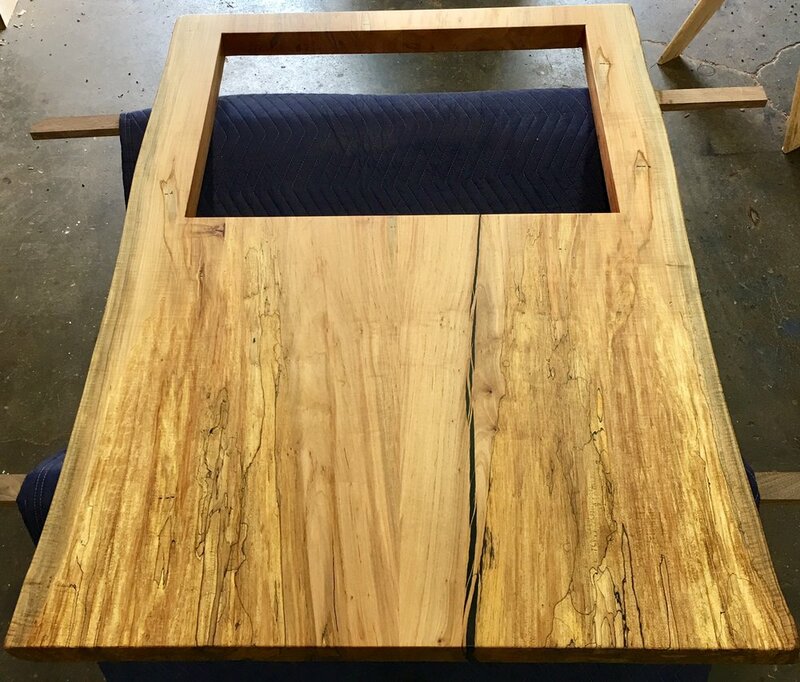 The table was finished with Pure (Clear) Rubio Monocoat and the square legs are 2" steel welded by Josh Wilford. The grain is eye catching throughout the entire piece. After 25 years of living in Columbus, customers Paula Nees and Joe Wheaton moved to Portland, Oregon. This Ash Slab along with an Elm slab (not pictured) made the cut to be trucked west. Joe plans to make a coffee table with the ash slab and project TBD for the Elm slab. One of our favorite parts of being in the wood salvage business is seeing pieces of Columbus spread throughout the nation.